Cruciferous vegetables are a group of vegetables that provide protection against certain cancers .Cruciferous vegetables contain antioxidants.The anti-cancer properties of cruciferous vegetables come from phytochemicals called isothiocyanates, which stimulate our bodies to break down potential carcinogens. Sulforaphane, found in broccoli and in even more concentrated form in broccoli sprouts, is a well-known isothiocyanate. 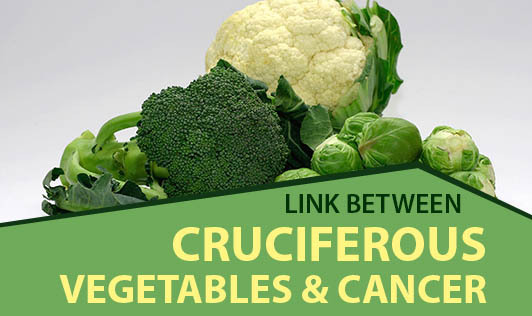 Cruciferous vegetables reduced the risk of prostate cancer. According to a research study published in Journal of the National Cancer Institute, greater consumption of dark green and cruciferous vegetables, especially broccoli and cauliflower, was associated with a decreased risk of prostate cancer. Victoria Kirsh of Cancer Care Ontario in Toronto and colleagues evaluated the association in 2,338 men who were at risk of developing prostate cancer; they were divided into 2 groups. The first group of 1169 men consumed 400g of broccoli per week in addition to their normal diet over 12 months, & the remaining 1169 just had a normal diet. Tissue samples were taken from their prostate glands before the start of the trial and after 6 and 12 months, and the expression of every gene was measured. It was found that there were more changes in gene expression in men who were on the broccoli-rich diet than on the normal diet, and these changes were associated with the reduction in the risk of developing prostate cancer.